The Falcons fall behind early and lose league-opener despite fourth quarter rally. 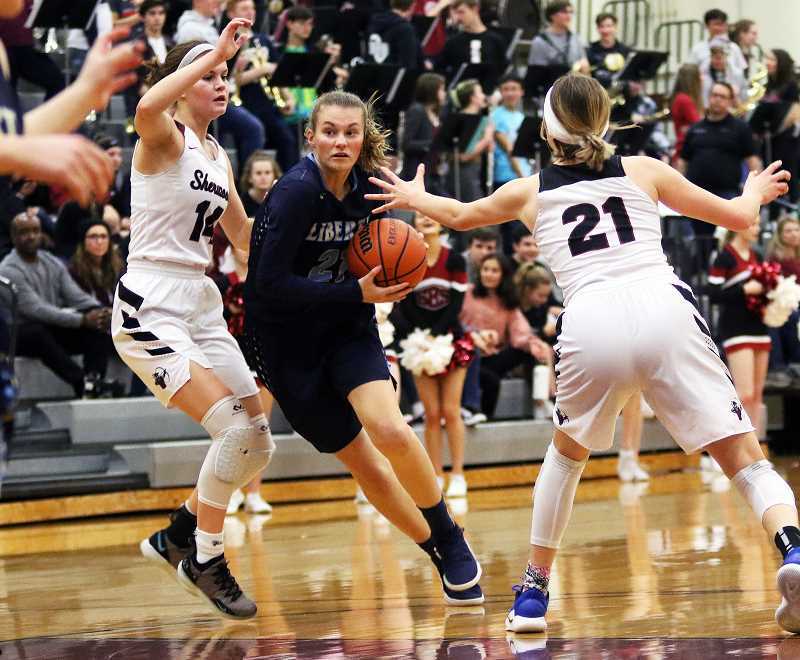 The Sherwood High School girls basketball team has high hopes for its first-ever season as a member of the Pacific Conference. With that in mind, the Lady Bowmen wanted to make a good first impression. And they did so at the expense of the Liberty Falcons. The visiting Falcons flew into a buzz saw at Sherwood, falling behind early, then rallying from behind before ultimately falling short, 43-33, Wednesday, Jan. 9, at Sherwood High School. With the loss in the conference opener, Liberty, which had a furious fourth-quarter rally to cut the final margin to 10, moved to 6-7 on the season. "We took three quarters to warm up, and that's too long," Liberty sophomore guard Taylin Smith said. "We know we can play like that. We just have to figure out how to play like we did in the fourth quarter the entire game." Meanwhile things went exactly as planned for the Bowmen, who are squarely focused on a league title. "We wanted a good start, with this first win, to put us out there," said Sherwood senior Alex Verkamp, who scored eight points in the victory. "We're hoping to be league champs, so getting this first win put us in the right position to do that." Liberty had a hard time explaining their sluggish start, but in the wake of what could only be described as a disastrous beginning to what they hoped would be a positive start to the conference slate, they fought to the end. "Our heads weren't in it the first three quarters," said Liberty junior post Clara Robbins, who led the Falcons with 12 points. "In the fourth quarter, we finally got an urge to change the game. We just got angry. We thought there were a few things that shouldn't be happening now." Sherwood improved to 8-5 on the season with the victory. "It means a lot," Aubrie Emmons said of the win. "The past few years, we've been in a tough league (the Three Rivers League), and it's been just a grind every night. So, being so close last year, this year we said 'we're just going to get it,' and we've got one up on the board." The Lady Bowmen got a pair of baskets by Emmons, as well as three rebounds and three steals by senior post Kaytlin Cooke in a slow-paced first quarter, helping Sherwood to grab a 7-3 lead at the end of the period. Sherwood then seemed to turn up the defensive intensity even more in the second quarter. The Falcons missed their first seven shots from the field in the period. Meanwhile, Sherwood went on a 9-0 run, which included a pair of baskets by Emmons, one each by Verkamp and sophomore Joley Sproul, and a free throw by Cooke, giving the home team a 16-3 lead with 2 minutes and 55 seconds left before halftime. Liberty ended the run with a basket on a drive to the hoop by junior Alexa Smith. Sherwood responded with back-to-back hoops by Emmons and junior Ava Boughey. The Falcons got a last-minute 3-point play by senior Maliah Jobe, trimming the Sherwood lead to 20-8 at halftime. The Falcons opened the third quarter with a 3-point basket by sophomore Livia Knapp, but the Lady Bowmen answered in a big way. A follow-up basket by Sherwood sophomore Kylah Williams ignited an 11-0 run, which included four straight points by Emmons and back-to-back baskets by Verkamp, giving the Lady Bowmen their biggest lead of the game, at 31-11, with 3:27 left in the period. 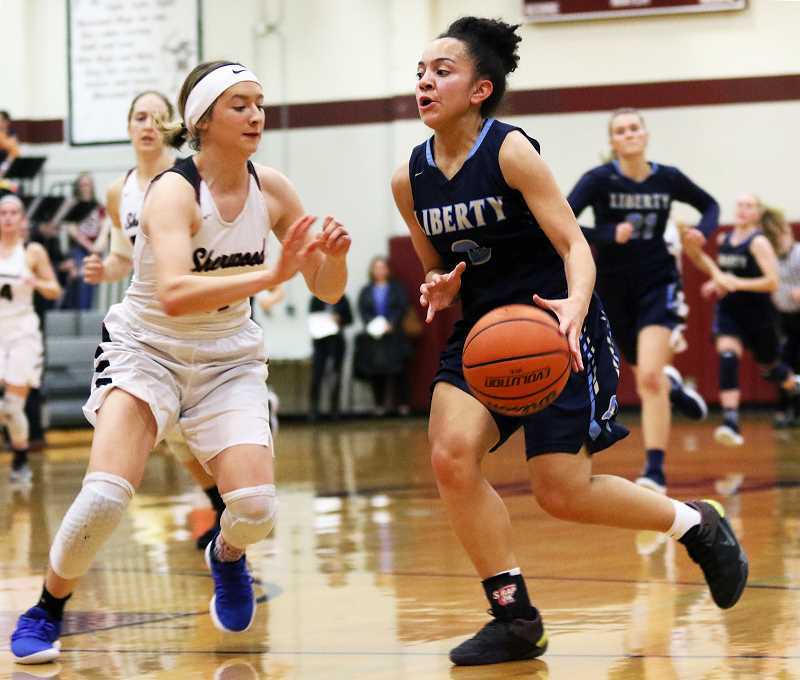 Liberty, tying to battle back, got four straight points by Robbins and a steal and layup by Taylin Smith, trimming the lead to 32-17 going into the fourth quarter. Sherwood would push the margin to 43-24 after Cooke sank a pair of free throws with 1:39 left to play. Liberty, not giving up, ended the game on a 9-0 run in the final 1:11 of the contest. Senior Emily Le got the run started with a pair of free throws. Robbins scored four straight points and Jobe finished the game with three straight points, making the final score 43-33. Still, the Falcons are encouraged by their strong finish to the game. "We're going to take that fourth quarter, and build off of that, and get rid of the rest, because that's not how we play, and not how we want to play," Taylin Smith said. Sherwood, as a team, made 15 of 35 shots from the field, with one 3-pointer, and 12 of 18 free-throw attempts. The Lady Bowmen, with Cooke and Williams leading the way, also outrebounded Liberty by a 33-18 margin. For Liberty, Robbins had four rebounds and two steals to go with her team-high 12 points. Taylin Smith scored seven points, all coming in the second half, and a pair of steals. Jobe also scored seven points for the Falcons. Liberty, as a team, made 10 of 47 shots from the field, with one 3-pointer, and 12 of 16 free-throw attempts. Both teams will be back in action on Friday. Sherwood will play at Forest Grove and Liberty will travel to Glencoe for conference games starting at 7:15 p.m.